Due to the limited evidence on the role of diet and cause-specific mortality among breast cancer survivors, current nutrition guidelines for this population are consistent with those for cancer prevention. We evaluated whether diets consistent with the American Cancer Society recommendations for cancer prevention were associated with risk of death in breast cancer survivors. Participants reported information on diet and other factors at baseline in 1992–1993 and twice during follow-up. A nine-point score reflecting concordance with diet recommendations was calculated. Multivariable-adjusted relative risks (RR) and 95 % confidence intervals (CI) for diet score in relation to overall and cause-specific mortality were computed using Cox proportional hazards regression methods. Among 4,452 women diagnosed with locally and regionally staged breast cancer after baseline and until 2011, 1,204 died during follow-up through 2012 (398 from breast cancer). Prediagnostic diet score was not associated with mortality from any cause. Postdiagnostic diet score was associated with neither breast cancer-specific mortality (RR 1.44, 95 % CI 0.90–2.30 for scores 6–9 vs 0–2) nor cardiovascular disease mortality (RR 0.81, 95 % CI 0.47–1.39), but compared to a score of 0–2, a score of 6–9 was associated with a borderline lower risk of other causes of death (RR 0.78, 95 % CI 0.56–1.07, p trend = 0.03; per two-point increase in score RR 0.88, 95 % CI 0.79–0.99). Of diet score components, only limiting red and processed meat consumption was associated with statistically significantly lower risk of total, CVD, and other non-breast cancer mortality. Diets consistent with guidelines for cancer prevention were not associated with breast cancer-specific mortality. However, their association with other causes of mortality underscores the importance of consuming a healthy diet in this population. The online version of this article (doi: 10.1007/s10552-016-0802-x) contains supplementary material, which is available to authorized users. We thank the CPS-II participants and Study Management Group for their invaluable contributions to this research. 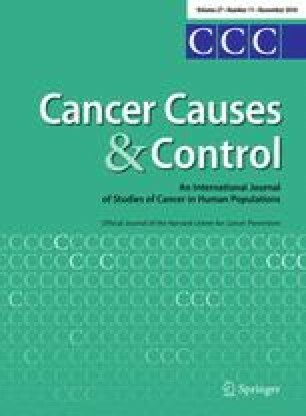 We also acknowledge the contribution to this study from central cancer registries supported through the Centers for Disease Control and Prevention’s National Program of Cancer Registries, as well as cancer registries supported by the National Cancer Institute’s Surveillance Epidemiology and End Results program. The American Cancer Society funds the creation, maintenance, and updating of the Cancer Prevention Study-II cohort. MLM, SMG, MMG, RS, and PTC made substantial contributions to conception and design, or acquisition of data, or analysis and interpretation of data; MLM, SMG, MMG, RS, PTC, and CD were involved in drafting the manuscript or revising it critically for important intellectual content; all authors gave final approval of the version to be published. All procedures performed in studies involving human participants were in accordance with the ethical standards of the institutional and/or national research committee and with the 1964 Helsinki Declaration and its later amendments or comparable ethical standards. The CPS-II Nutrition Cohort is approved by the Institutional Review Board at Emory University.